Trolling spinners have become one of the most effective lures for catching salmon and steelhead in the Pacific Northwest. Over the last year, we started developing our own signature line of trolling spinners that incorporate our eco-friendly natural Stone Cold Beads. 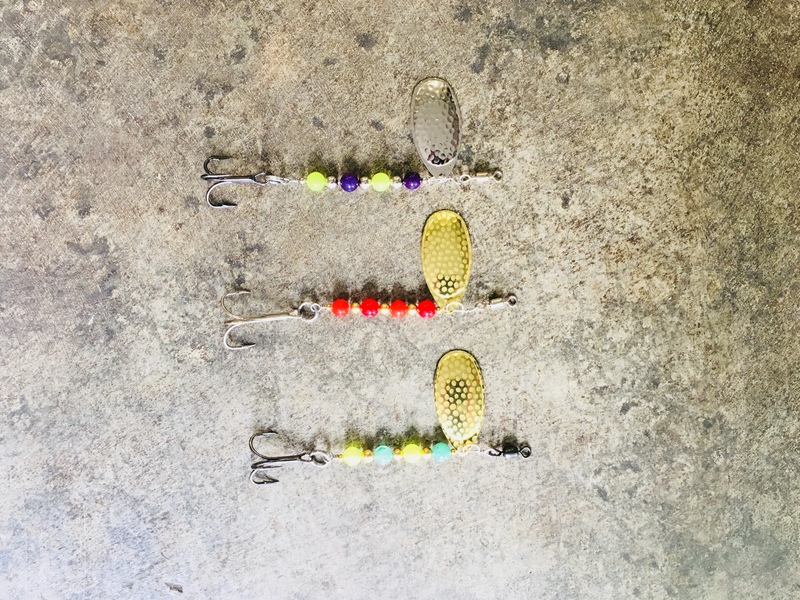 After a bit of trial and error, we believe we’ve found the perfect combo of bead versus blade that really drives the fish to the bite. In our region, the reds and chartreuse colors seem to have the greatest effect on the aggressive fish the Pacific Northwest has to offer. This is why we’ve incorporated our green grape beads and fire engine red beads into many of our trolling spinners. We decided to offer two options in regards to hooks for these lures as some areas in the Pacific Northwest do not allow treble hooks. Also, we’ve incorporated UV tubing as a hook stabilizer to help increase hook sets. Another key element of our trolling spinners is the weight. Our trolling spinners are a bit lighter than our casting spinners as not to affect the action of a flasher. To improve effectiveness, we’ve incorporated some of the most fish attracting spinners blades made. We currently offer trolling spinners with the ever-popular 3.5, 4 and 4.5 Colorado blades. Size 6 Hammered French blades and the larger, wider size 6 Olympic blade, also known as a Wide Willow or Cascade blade. Also with our Dirty Troll Elite series we’ve incorporated the more expensive gold and silver plating for its optimal reflective capabilities as well as durability. Another important feature of our Dirty Troll Spinners is that we applied sold metal accent beads rather than the hollow ones. What makes this important is that solid beads do not tarnish in salt water as rapidly as the hollow beads do, thus increasing the life and effectiveness of the lure for saltwater applications. Each Dirty Troll Spinner is unique as our gemstones are natural and tend to vary in color and brilliance. These beads have proven over and over again to attract fish and now with our spinner line, we are producing custom-made fishing gear that catches fish over and over again. You will not find these spinners anywhere else. We are the only tackle manufacturer that uses natural stone beads on their lures setting us apart from the rest of the industry. Try our SCB Dirty Troll fishing Spinners today and start fishing dirty!